Are you suffering from hair loss problems? Are you sad looking at your hair getting lesser and lesser everyday? Don't you think that it is very upset to hear that people saying you getting bald? I've been seeing my own hair on the floor every time after I bath, even I can feel my hair falling when I brush my hair with my shampoo. I think I'm also one of the victim for hair loss problems, and now I am desperately seeking for solution. This problem have been troubling me for quite some time and some time I'm in the mid of 20's so I am not suppose to suffer from this problem. Well I'm lucky that I've been given a chance to visit Yun Nam Hair Care for a free trial of hair herbal treatment to ease my hair loss problems! So I went to the Yun Nam Hair Care branch that located inside 1st Avenue Mall, Penang. They have saved a lot of people that suffer from hair loss problems. The friendly consultant from Yun Nam Hair Care helped me to do the registration and helped me to do a scalp test to see what are the main causes to my hair loss problems. Hair loss could be caused by a lot of issues such as stress, dry scalp, oily scalp and etc. The consultants are so helpful and friendly, you will definitely like them! If you have any enquiries about your hair or scalp, you may also refer to Yun Nam Hair Care and tell them about your case. They will help you to do scalp test and analyse for you about your scalp condition. You can have as many questions as you want, they will try their best to solve all your quires. This is the treatment room, or you can call it the saloon. The place is so clean, but you can smell the herbal all over the place, as Yun Nam uses natural herbs to ease your hair problems. The whole free treatment will take about 45 minutes, all you need to do is to relax your mind and rest at the saloon. This is how the treatment cream looks like, made with natural herbal. Though it smells a bit odd but it is healthy though. But bear in mind that the smell is gonna stick to your hair for about 1 week. This was how I look like when I was doing the treatment. My scalp was a bit cool because I've been told that their herbal is inclusive of mint as well. Though the smell was a bit odd, but it is healthy and feeling so good. After that, the consultant help me to do another scalp test after the treatment. My scalp is obviously more clean than before the treatment. The consultant told me that my scalp was too oily and that is why I am having hair loss problems. They are really helpful and everything was so informative, they are clear about their products and they can answer all my questions. Which inclusive of shampoo, conditioner and also lotion. Don't suffer in silence anymore! Visit Yun Nam Hair Care to let them help you with your problems! Yun Nam is now giving out more freebies for my readers! How to redeem these freebies? Millions of people suffer from hair loss worldwide. To solve this, many treatments and solutions are available. Among the many choices available, many people prefer hair loss concealers as their temporary solution because they are a better option when compared with other alternatives, such as other hair loss treatments like wigs or hair transplantation procedures. 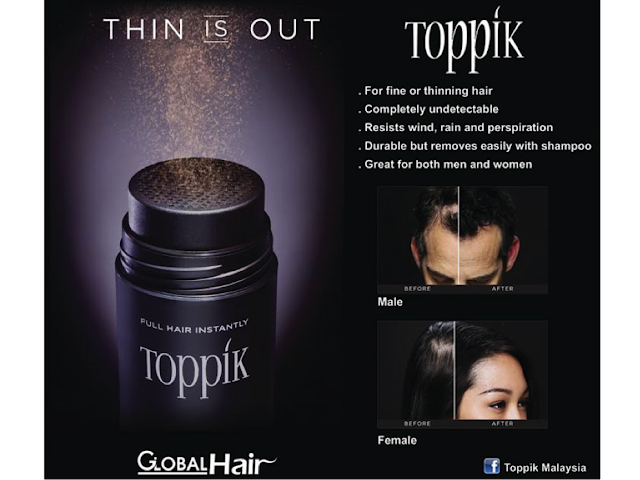 With that being said, the best brand in the market for hair building fibers is definitely TOPPIK! TOPPIK Hair Building Fibers is a top-rated hair loss concealer that provides various benefits. The fibers effectively cover up thinning spots without restricting the growth of hair follicles. Moreover, they are easy to apply and will produce results within seconds. 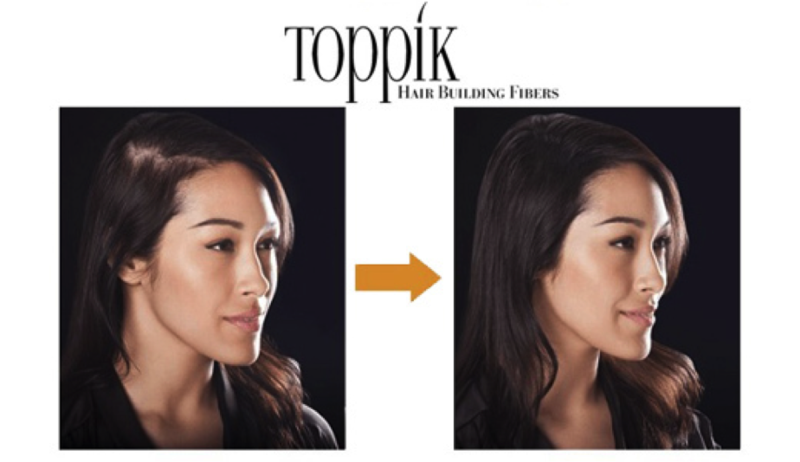 Just pour TOPPIK Hair Building Fibers over the thinning areas at the scalp, and the fibers will immediately attach to the hair strands to give thicker hair. This is due to advanced Nano technology, where the fibers are charged with electrostatic energy to provide full magnetic attraction to the hair. 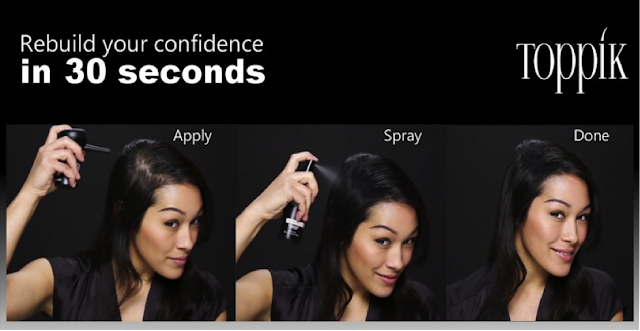 This means that the fibers are capable of giving you a full head of voluminous hair in under 30 seconds! Not only that, the bond between the fibers and the hair are so strong that it lasts the entire day, yet the fibers can be easily removed by shampooing. See the transformation at http://toppikmalaysia.com/before-after. Another advantage to TOPPIK Hair Building Fibers is that they are made of only natural and organic ingredients without any harmful additives or chemicals. The fibers are essentially composed of organic keratin protein. The keratin protein is the exact protein of human hair. Furthermore, TOPPIK Hair Building Fibers are hypoallergenic and suitable for all ages and genders without causing any unpleasant side effects such as itching or dryness. Also, they are extremely convenient to use because they resist sweat, wind, and rainwater. Hence, they do not cause any hassle at all for outdoor activities. TOPPIK Hair Building Fibers have the greatest value for money when it comes to camouflaging thinning hair. Visit our shop http://www.toppikmalaysia.com/shop to find out more. There are more and more restaurants coming up in Penang, but not much of them are non halal restaurants. Now I'm telling you another new restaurant in Penang that serves pork, featuring the fusion of Asia dishes. 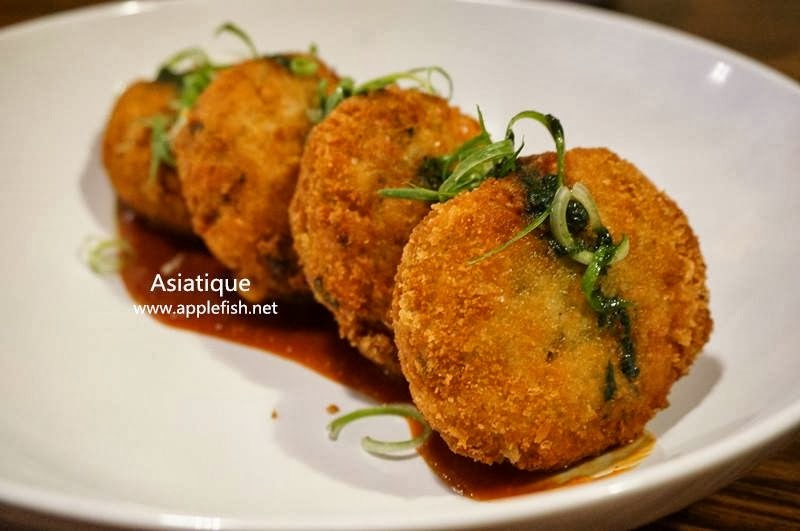 Asiatique is quite new in town, it is been opened since September 2013 and I finally gave it a try. It is located at Vantage Desiran, Tanjung Tokong. A new shoplot building that full with potentials and opportunities. The ambience of the restaurant was quite comfortable, another semi fine dining feel with soft music and dim lights. Would be great for a date or hang out with friends for a short catch up. There are variety of wine for you to choose, can you spot MOET from here? Some of the pictures below are captured by Chloe from http://www.applefish.net/ due to I was late to the place. This starter was kinda good as it was rather crispy and not oily. The sauce that goes with this dish is very appetizing as well, this starter was kinda filling, I would suggest you to order this if you come with your family. This is the green pea soup that they serve. It was rather special as it mix with some parmesan nutmeg foam as you will taste both nutmeg and parmesan at the same time. This combination was rather fresh to me but it was not bad at all. The cinnamon lavosh was rather crispy and it went well with the soup. Does chilled tofu sounded weird to you? But I can tell you that it didn't taste weird at all! The mixture of chives, hoisin jam, dried shrimp and caviar that goes with the tofu was really great as it was a bit salty and made a perfect combination with the chilled tofu. Not bad for a starter to a meal! This soup was rather special as I never taste the mixture of potato and leek. 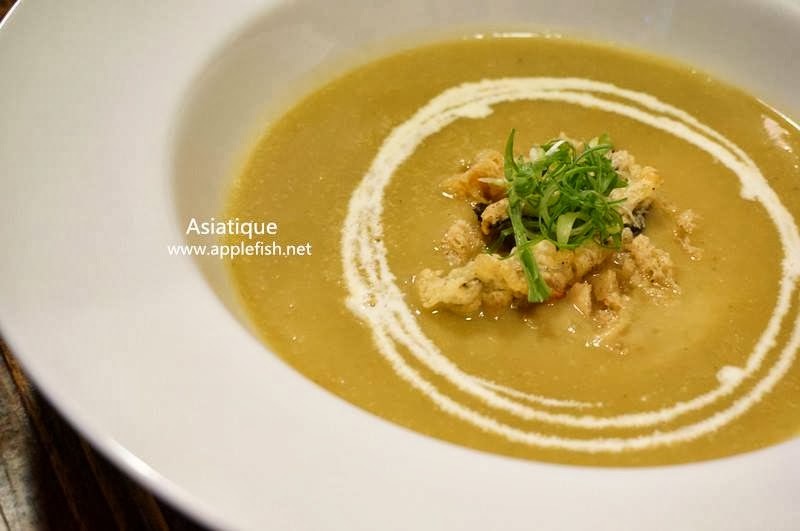 Asiatique used tofu puffs, which is so Asian's style instead of bread crumbs, and tofu puffs absorbed the soup and became so juicy. Thumbs up! This dish is rather appetizing with all the pickles on top of the fresh salmon. 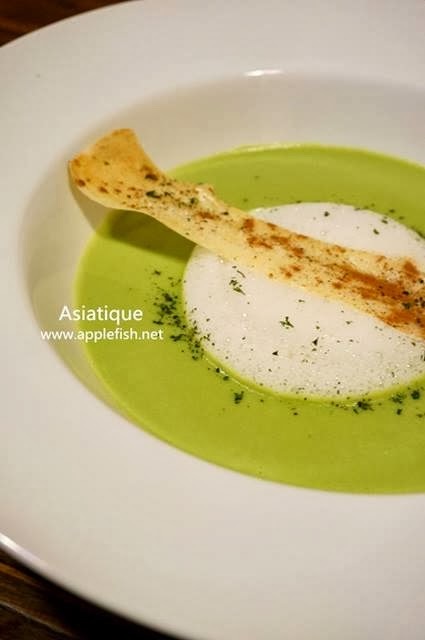 It is rather unique to have laksa cream to top with the salmon and at the same time the prawn foam to mix into the dish and make it tasted even more special. But for those with big appetite, you might need to order more dishes. Highly recommended! Roasted pork to go with Aglio Olio? This is something special! Normally people would have take bacon with Aglio Olio, but this is roast pork! The roast pork chopped into small pieces to add into the aglio olio and mixed with the basil to make it taste so perfect. Must try! The duck breast has been cooked to perfection, it was tender and juicy! It also absorbed the sauce and cut into slices that made every bite so tasty! I also love the yam puree that tasted sweet, soft and smooth. It will be great if I were to have it with a bowl of rice! I always have poached chicken egg but not duck egg, I didn't know that poached duck egg could taste so good! The pork belly was so soft that once you put it into your mouth, it will melt in your mouth. Just taste it with your tongue! I can't help but to mention about the spinach, the spinach is so nice and it is not bitter at all. This would be really perfect if I can have a bowl of rice to go with the dish! Does it sounded special to you? Even the taste was special as well, it was rather creamy but not the cheesy type that might be too creamy that you can't finish the whole plate. But this is something different, something lighter than cheese but still can be creamy and appetizing. The Garlic Sambal went well with the fettuccini and made a perfect combination! Done with all the main course, let's get to some desserts! No matter how full you all can be, I believe there are always some spaces for desserts! The poached pear is soft and covered in sarsi, but it is not too sweet! Definitely love the rambutan salsa as well, which added some sour and sweetness to this dessert and made your taste bud dance! Out of all the desserts that served that night, I would give this the highest marks! I really like the hot strudel mixing with the cold ice cream as when it melts in your mouth and all you gotta do is just enjoy the coldness and hotness at the same time. As what the name said, the pudding is actually Kopi 'O flavour, which is so Asian's style! It goes with Kaya Mousse and their homemade Teh Tarik ice cream! One side of ice cream and kaya were sweet and the pudding was bitter, another good combination to challenge your taste buds! Chendol dessert is always my top favourite, but making it into panna cotta was totally new to me! I was a prefer if this dessert to be sweeter and the texture to be more liquid. You may try this if you don't really like over sweet desserts. Dining at Asiatique is very comfortable, quiet and romantic. I would recommend couples to dine in here and pair your meals with some nice wines, I am sure the couples will have a great moment in Asiatique. Other than that, families can also spend their time at Asiatique to try out some nice Asian dishes with western styles as well. 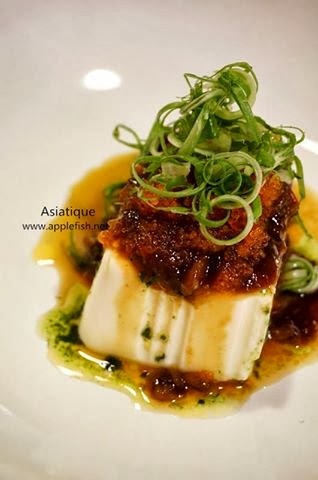 It would be totally out of your expectation of how they could make Asian delights into western cooking style. This restaurant worth a try! Address: C-G-3 Vantage Desiran, Jalan Desiran Tanjung 10470 Tanjung Tokong, Penang. Street Arts are no longer something strange in Penang, especially around Georgetown area. Thanks to the artist, Ernest Zacharevic, that Penang has became well known and attracted more tourists to visit here. Art is LapZap is an art expo in Penang. It is located at Hin Company Bus Depot, entrance is FREE. I know it is now too late to share this news, but this post is something about the arts in Penang. Please do not touch those artworks! Selfie before I left the place, simply amazing! Location: Hin Company Bus Depot, Jalan Gurdwara, Georgetown, Penang.